Self-driving cars and autonomous vehicles have been caught dozens of times doing ridiculous things on public roadways - allegedly. Here is our rundown of the ones we know about. Remember, self-driving cars could be doing this stuff every day and nobody catches an image or video. At the very moment a pedestrian steps into a crosswalk in busy downtown San Fransisco, a self-driving Uber vehicle goes through a red light and is caught on camera. Not a yellow. A red light. Uber blamed the driver, but evidence counters this claim. It is later learned that the vehicle did not run a red light. It ran six. Had it not been captured on video, we never would have known. A Google autonomous vehicle parked by the side of a busy road (sort of like it would be if picking up a passenger) pulls from its spot directly into the side of a huge, slow-moving city bus, jarring both vehicles. The accident is caught on video and posted to Youtube. Following the crash, Google admits it bears "some" of the responsibility for the crash. On its maiden voyage, an autonomous shuttle found a way to crash. What a coincidence! The accident was not filmed live, but the still images and the account of the crash from those on the shuttle explain that the bus pulled up on a semi-trailer that was backing up. When a pending collision became apparent, the shuttle did not sound its horn, did not back up, and made no other maneuver to avoid the slow-speed crash. Will you sleep better knowing that when a crash is about to happen your self-driving vehicle will just freeze? Of all the things most easy to see is a huge red firetruck with lights flashing the easiest? It may well be. Yet, the driver of a Tesla Model S somehow found a way to hit the back of a firetruck parked at an accident scene. The vehicle's automatic emergency braking did not prevent the crash, the driver took no action to avoid it, rather, the Autopilot system the driver says was active at the time drove it straight into the back of the firetruck according to reports. Luckily, no fireman was standing behind the truck. Tesla vehicles can drive themselves around a bit with nobody inside. It is called Summon mode. The idea is you are at a place where you want to impress people. You summon your $150,000 electric minivan and it silently glides up to you and impresses everyone including your date. Except, sometimes it just crashes. And then you stand there looking at a vehicle with a lot of damage and wonder whose fault the accident was. One owner summoned his Model X to come out of his garage. As it drove out, the garage door also came down and the two found themselves in a disagreement over who's physical space that was. Like every Tesla crash, nobody who likes Tesla believes this story. Except this guy. A self-driving taxi found a way to have its front bumper contact the side of a light truck in Singapore. At the time of the crash, the folks from NuTonomy could not say out how the lorry driver managed to assault the front of its self-driving taxi with the side of the truck. Who was at fault in this one is a real head-scratcher. We know you can't wait for us to get to the fatalities, but hang in there buckaroo. The latest crash which we are all talking about was not Uber's first self-driving crash. It wasn't even its first self-driving crash in Tempe Arizona. 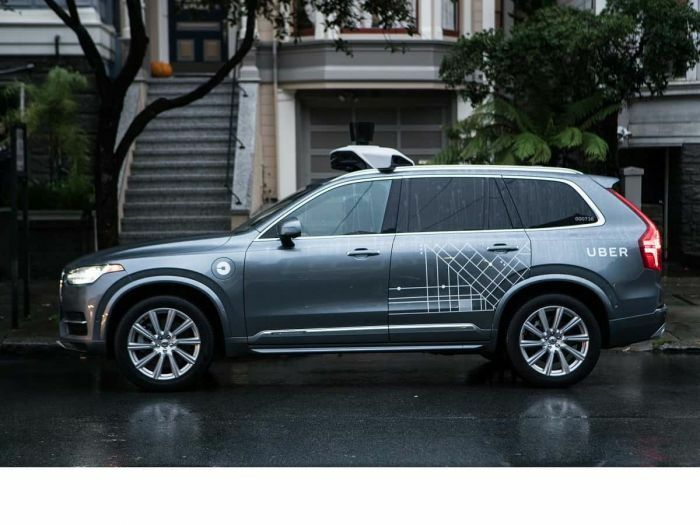 Last year, an Uber vehicle in self-driving mode ended up on its side when another vehicle "failed to yield." Here's a quick note to Uber: If your vehicles crash into ones that fail to yield, Massachusetts roundabouts and rotaries are going be very exciting! Let's get serious now. Should autonomous vehicles be allowed to operate above the speed limit? This is a question that came about after a former U.S. special forces service member was tragically killed when his Model S operating on Autopilot hit a slow-moving semi-trailer that had pulled into its path at a legal intersection. The Model S never slowed from its speed, which was above the posted limit, before hitting the side of the truck and continuing on. After every possible way to blame the working man behind the wheel of a truck who was hit by a speeding vehicle with nobody controlling it didn't work out, the NTSB issued a report that pointed the finger at the Tesla. This week a Tesla Model X crashed into a highway divider that had reportedly been hit once prior. The impact killed the driver and the Model X caught fire. The NTSB is investigating to determine if the Model X was on autopilot according to EV-advocacy publication Elecrek. If the vehicle was not on autopilot, Tesla should explain why a six-figure minivan can't stop itself using automatic emergency braking. The latest and most tragic of all of these self-driving vehicle crashes is, of course, the one in which a woman walking a bicycle in Arizona was hit and killed. Apparently, the Volvo safety systems in the video below were disabled by Uber and its partner company. The fallout from this accident will be harder to sweep under the rug.